Great product for people needing dairy gluten free! Tasty! Tastes great but should come in a larger size. At first, it really surprised me. It will surprise you as well if you compare it to the generic name brand. The consistency is a very different - it almost feels like oil. But it doesn't overpower the taste of the veggies I'm eating it with. Its like a glaze that goes over my veggies to enhance what I' eating - Definitely a new customer. This stuff is delicious! I was extremely pleased. The bottle is a little on the small side, but made 3 full salads before running out. It's on the runnier side, but it totally works. I had been craving caesar salad for almost 2 years and this finally gave me the flavour I desired. I love it and will be buying a lot more! Tasty, creamy and flavorful. Quality dressing. 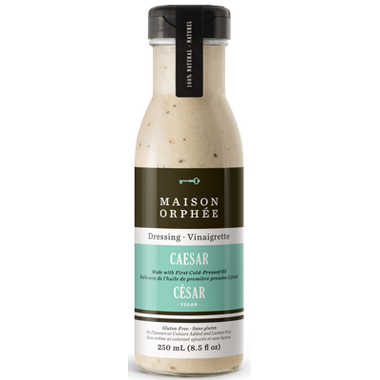 I made a lovely lemon chicken Caesar salad for supper and used this dressing on it and everyone had three helpings! Even my father, who prefers the traditional Gracy Caesar dressing, couldn't get enough of it and just raved about how good it was. Everybody said they loved the fresh flavour of this dressing. So I will definitely be purchasing this in the future. YUM! not to thick not to oily. SOo. happy that there is a vegan ceaser dressing!! I will get this again. This is the best vegan Caesar dressing by far. Love this dressing. I'm so happy I have found a vegan dressing that tastes great!!! I personally did not like the taste and the consistency kind of grossed me out. It seems really oily. There are better vegan caeser dressings out there. It wasn't terrible, but honestly there are way better options out there. This dressing is amazing! As a vegan I am often left with few quick and healthy choices that taste great and add variety to my diet when it comes to condiments. Not only does this taste amazing but it is versatile - it is a vinaigrette that I use on everything from tofu to vegetables to even grains. I am looking forward to trying other flavors in this line.